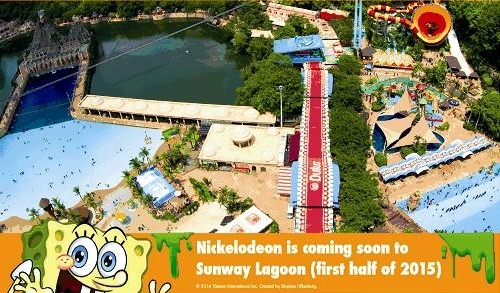 Sunway Group has expanded its strategic collaboration with Viacom International Media Networks (VIMN) Asia, to develop Nickelodeon Lost Lagoon at Sunway Lagoon. Nickelodeon Lost Lagoon will become the first Nickelodeon-themed land to be launched in Asia and is expected to open in Kuala Lumpur, Malaysia by mid-2015. Nickelodeon Lost Lagoon will feature immersive attractions like an Oasis Lagoon Splash Pad and climbing structure, an interactive water play area using reactive technology, daily signature slime events, a variety of other water slide attractions, retail shops and food service establishments themed with Nickelodeon’s hit properties, including Sponge Bob Square Pants, Dora the Explorer, and Teenage Mutant Ninja Turtles.